I'm very busy getting ready for a craft fair on Sunday, but I still wanted to participate in VTT this week. Pouring over all the entries each week with a cup of coffee is a great way to relax. So, I started looking around for something that would make a simple but interesting post. The answer was literally staring me in the face. On display in one of the cabinets in my art room is this great little book that I picked up a couple of years ago. This is the fourth edition, the first published in 1900, this one in 1923. 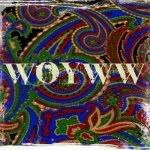 It seems that in the post-industrial age, each generation feels that they are busy and rushed, even as we look back to their time of simplicity with envy. I wonder what the author of this paragraph would think of the way we live today. I love this illustration also near the front of the book. Time was definitely on their minds. Much of the information in here is obviously out of date. Alaska had been purchased by the US but was still a judicial district "like the District of Columbia," Korea had been annexed to Japan 13 years earlier and was then known as Chosen, and the population of New Orleans was 387,219 people. But there is still interesting and relevant information to be found. Did you know that the name Nevada comes from Spanish meaning "White with snow" (lovely) or that Nebraska is a Native American word meaning "Water Valley" or "Shallow River"? BEG LEAVE; we commonly see correspondence beginning with the words, "I beg to acknowledge the receipt of your letter," but that is wrong; we should say "I beg leave to acknowledge," etc. Helpful information, though not so much today. Well, I hope you've enjoyed my little peek into the past. Don't forget to make the rounds to see many more. Here is another quick birthday card, made again with the stamps from Purple Onion Designs, the dp from DCWV and my Fiskars Shape Cutter. I can't wait to show you the adorable (if I do say so myself) card I made last night for a 1 year old boy, but I'm also in the process of making the same basic card for a girl and I want to post them together. OK, there's a little Basenji running around my living room like crazy because he sees the sun for the first time in days, I'd better get him outside. 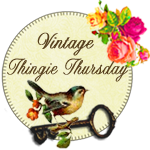 See you later for Vintage Thingie Thursday! Very, very busy here. I had time to create this card yesterday and then it was on to other fair business. I thought of listing all those tasks here for anyone who might be interested in doing fairs, but I thought it would be a bit boring to just list them here with no reference. Instead, I'll do a post after the fair, with pictures of our displays and some narratives of anything that isn't self-explanitory. I love this card. I wish I had the time and materials to make a dozen more and send them out for Halloween. Given a little more time for this card, I would have tried the faux paneling technique from Technique Junkies to add to the look of a wall behind the witch, but I'm happy with it the way it is. The Poe image is from a collage sheet, and the hat and cat are from another. The "witch" is a scan of an original image from my personal collection. The sentiment is from Purple Onion Designs and the candelabra is from Oxford Impressions who, by the way, just came out with another fun Halloween collection. If I have the time, I may turn this into wall art as well. We'll see, and I'll see you again soon. Another birthday card to show you today; an adult card this time, for a Dad. Again I turned to the photo of the 1914 Hudson from my Grandfather's photo album. I love it, and I think it works so well for a masculine card, especially paired with the Distressed Frames technique from the TJ newsletter. The sentiment is from a set of Father's Day stamps by Cornish Heritage Farms. I had wanted this set and their Mother's Day set for some time, but always put it off until "next year." Then I heard that CHF was going out of business, so I got right on Ellen Hutson's site, but they were gone ALREADY. Luckily I found them on Amazon through a Google search - whew! I just love the sentiments on these sets and I realized that they'd work well on birthday cards too. The cardstock and dp on the front are distressed with my most expensive crafting tool...not...my seam ripper. And I used scalloped edge scissors to create the ticket punch look for the sentiment. OK, things are really heating up here but I have lots to show you so I will be back again soon! After yesterday's sympathy card, I thought today I would post the opposite, a baby card. Once again I looked at the cards in my spinner and realized they had to go. This time I used the same stamps as the old cards, but reworked the design. The peas in the pod are from 100 Proof Press, the baby in the pod is from All Night Media and the sentiment is from Rubber Stamp Tapestry. I have to admit that I'm a little envious sometimes seeing all the wonderful shapes on cards out there. I really want some Nesties and an embossing machine. But they are sooooo not in the budget right now, so yesterday I went rummaging in my craft room and found my Fiskars oval cutter and circle cutter. I finally realized (way too late to return it) that the problems I had initially with the oval cutter were not because I don't know how to use it, but that the cutter sticks. But I used the circle cutter for this card and had no problems cutting, in fact it cuts like a dream. The only problem I had with it is that you can barely see the piece that shows you the measurement of your circle. You have to play with it, and you'll never get an exact size if that is what you are looking for. For ovals, I still have my shape cutter, but with that you use templates and there are only a few oval shapes, so its a bit limiting. For now, though, I can make circles any time I want. Sympathy cards are not exactly fun cards to make, but when I was looking through the cards for display on my spinner rack that I use for shows, I realized that the sympathy cards were not only old, but that I really didn't like them anymore. I saw something recently that I liked on another blog, but do you think I can find it now to give her credit? Of course not. Anyway, this is my take on that card. And if I can find the inspiration, I'll link it later. The inspiration card, as I recall, was all white and one layer, except for the sentiment. It did use the same CB folder and sheer white ribbon. The stamp I used is from My Sentiments Exactly. This may sound strange but, being a cardmaker, I saved some of the many cards I received when my father passed away for inspiration in my cardmaking. My favorites were the ones that were delicate and pretty. That was what attracted me to the inspiration card, and was the look I wanted to recreate. A few posts ago, I said I would be making more cards with those cute stamps from Purple Onion Designs and the bright and cheery paper from DCWV. I stuck to girly papers for this card, added some texture with my Swiss Dots CB folder and a little bling with a pink felt flower. For this boy's card, I kept it simple, but I did stamp the "4" to pick up one of the planes in the designer paper. Oh yeah, I used Splitcoast sketch #164 for the layouts. So much to do, just over a week until the show. But I will be back soon! This week I am sharing a charming card game that I picked up two summers ago in Vermont. It was not really in my budget that day, and the box is not exactly in mint condition, but I just could not resist the illustrations. This is a Victorian-era card game called Cheery Families. One of the greatest things about Vintage Thingie Thursday is that I've learned so much about my own vintage objects. I did a little bit of research on this game when I first got it home (just enough to make sure I hadn't overpaid), but in order to make this post interesting, I did a little more. This game was produced by Thomas De La Rue & Co. who's designs for playing cards are the basis for the modern standard design. The company still exists today as De La Rue and is a security printing, papermaking, and cash handling systems company*. Cheery Families is De La Rue's version of Happy Families, which spun off a whole genre of card games and is one of the most popular card games ever invented. I found this information here, where you can also see some examples of these other games. See now why I couldn't resist? Cheery Families was illustrated by Richard Doyle, who's initials are found in the gardener's pot below. Richard Doyle illustrated for Dickens, Thackeray, Ruskin and Punch magazine and he was the uncle of Sir Arthur Conan Doyle, author of the Sherlock Holmes mysteries. With all this new information, holding these cards feels like holding a little bit of history and I'm even happier now with this purchase! And you can see a few more of the cards here. Thank you, Suzanne, for all the work you do putting this together every week. I might never have found all this great information if I weren't sharing these cards for VTT. I hope you've enjoyed this post, here is the link to visit all of the other participants. Have fun! *Another interesting tidbit I found: De La Rue sold their card making business to Waddingtons in 1969. Much earlier, Waddingtons became the publisher of Monopoly in the United Kingdom. In 1941, the British Secret Service had them create a special edition of the game for POWs held by the Germans. This edition held maps, compasses, real money and other objects to help them escape. They were distributed to the POWs by private, often fictitious, aid organizations - and not by the Red Cross as has become the urban legend. Waddingtons was acquired by Hasbro in 1994. Posting a bit later than planned today. The dog was having his usual afternoon sunbath on the bed earlier and I decided to join him. What I thought would be a few minutes turned into a couple of hours. Not a bad way to spend a Sunday afternoon, though. Earlier, I finished this Christmas card for my Godmother. The little boy in the picture is her father, my Great Uncle William "Pin." The photo comes from my grandfather's photo album and was one of the first that he took with the new camera he got as a gift for Christmas in 1914. I realized a few months ago that his picture would be perfect to use in Christmas cards for my Godmother and her brother. After yesterday's cardmaking fiasco, I was going through the Splitcoast gallery for inspiration and came across a link to a blog called Instead of Ironing. Wow! Fabulous cards and tons of inspiration. So much in fact, that I CASEd the layout from this card. Gorgeous, right? My card is A6 size - 4 1/2 x 6 1/4. This was dictated by the size of the photo which got lost on an A7 and took over an A2. I used stamps from Rubber Stamp Tapestry's Holly border set on the strip of kraft cardstock near the bottom and the sentiment is from Stampendous. Back to the art room to put away the paper that exploded in there earlier. I'll see you tomorrow. When I decided to open Milestones and Miracles on Etsy, I knew that I didn't want this blog to become just an advertisement for the store, and I still feel that way. That said, unless you want to hear about my housework, errands, or homework, that is really all I have been up to the last few days. I've been reworking my wall hangings because of problems with the seam binding. I replaced the jewelry findings and seam binding with fibers and I like them both much better now! I also did some detail work on some hangings I haven't photographed yet. And I completed some cards for the shop. I used this week's sketch over at Splitcoaststampers. I reworked an old card using an image from my grandfather's photo album for this one. You wouldn't believe how long this one took me, unless you're a cardmaker and then you know how it goes. A very simple layout and very unlike the idea that I started out with, a little cursing and hair pulling along the way, but a simple and effective result. So, there you go, that's what I've been up to the last few days. I'll see you again tomorrow.